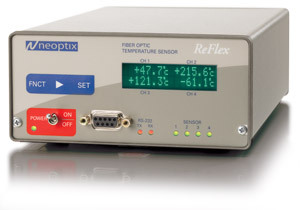 The Neoptix Reflex is a multichannel signal conditioner for fiber optic temperature measurement in industrial and laboratory applications. The Neoptix™ Reflex™ is a multi-purpose fiber optic temperature thermometer that can have up to 4 channels. It allows the user to take multiple temperature measurements for accurate information on industrial processes. This fiber optic temperature measurement system is designed to meet laboratory requirements but is also well adapted to industrial environments. The system is based on the proven GaAs technology. An original algorithm is used to analyze the signal and provide repeatable and reproducible measurements. 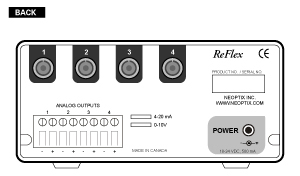 The Reflex™ is easy to interface to an existing system via its analog output or its RS-232 communication interface. When used with the optional Neoptix OptiLink™ software, the Neoptix Reflex becomes an indispensable laboratory instrument. The probe ’s immunity to electromagnetic interference and harsh environments makes it very advantageous compared to traditional sensors. Fiber optics being made of non-conductive material, they are inherently immune to EMI and RFI interference. The Neoptix™ Reflex™ is well adapted to both laboratory and industrial environments. Its accuracy and high sensitivity to temperature changes, as well as the selection of probe models available, make it a natural choice for a wide variety of applications. Moreover, the Neoptix™ sensors are interchangeable and no calibration or inconvenient gage factors are required when changing sensors. 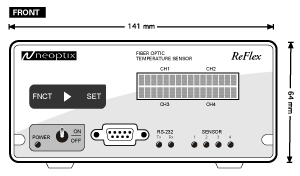 The Reflex can, optionally, be calibrated to monitor temperature as low as 4.2 K.
Neoptix has also developped a LabView™ driver for the Reflex, allowing an easy and quick product deployment into your lab or control room. Reflex signal conditioner cryogenic range special calibration. Use your Reflex to minitor temperature at cryogenic level, as low as 20 Kelvin! A one-time permanent calibration must be performed at factory.